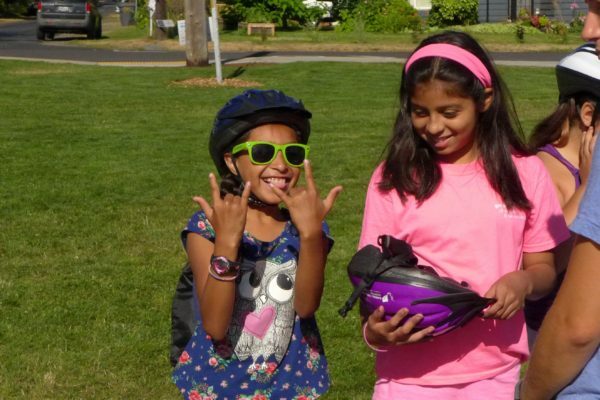 “What I like the most is that I get to bike around all the time at camp.” This is the most common answer I heard when I asked our campers at scholarship camps what their favorite part of bike camp is. The scholarship camp is a unique opportunity for children from low-income backgrounds at our partner organizations to enjoy biking fun and explore nature around them. And the best part is, they get to keep their bikes at the end of the week. 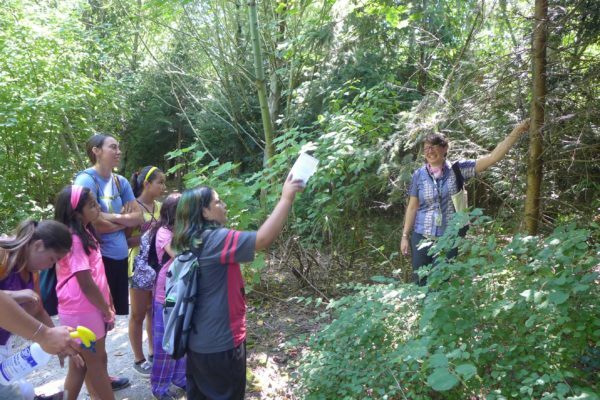 I shadowed our two scholarship camps for a day this summer, when they were scheduled to visit two public nature parks. It was both a lot of fun and very informational. The first scholarship camp was in cooperation with Boys and Girls Club in New Columbia, and we were scheduled to go to Smith and Bybee Park. It’s about a 20-minute ride from our bike hub in New Columbia. After an easy ride with some morning breeze, we reached the woods, ready to learn about the park and spot some wildlife. The two guides from Metro were already waiting for us with binoculars. Everyone was very excited and started asking for the binoculars as soon as they saw them. They proved to be very useful. 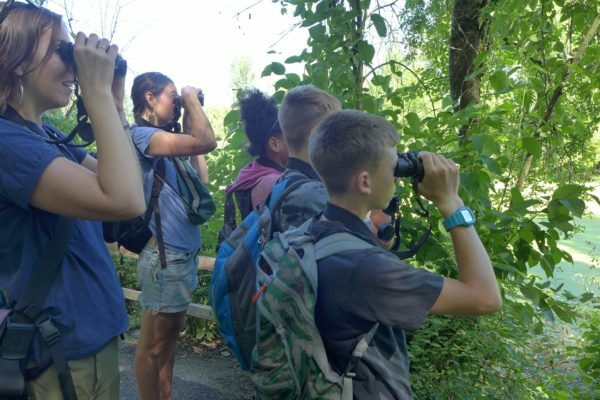 Thanks to the binoculars, we were able to spot quite a bit of wildlife, such as turtles, bullfrogs, egrets and a variety of other birds enjoying the beautiful weather and going about their day. First following the instructions of our guides, the kids then soon started finding more animals on their own. “Look! There’s another turtle on the log.” “Ooh! Where is it? Let me see!” “You see that tall tree directly across from the river? Follow the trunk and draw a line between it and the rock in the middle. It’s near the middle of that line, on a really small branch.” That’s some expert descriptions of wildlife location that I overheard! They were really eager to share with their friends. We also saw a couple of egrets gracefully walking through the reeds. It took some convincing to make our campers move on, but it’s totally understandable—it’s hard to keep walking when you see such mesmerizing creatures. The woods and the ponds are full of secrets and signs, if you know where to look. Thanks to our guides, we learned so much about the animal residents there. One of our observant campers found a cluster of grey feathers on the ground and asked the guide what type of the bird they belong to. Sad but fascinated, we all passed around the feathers to have a closer look. It’s amazing how much information you can obtain through such small things like feathers. 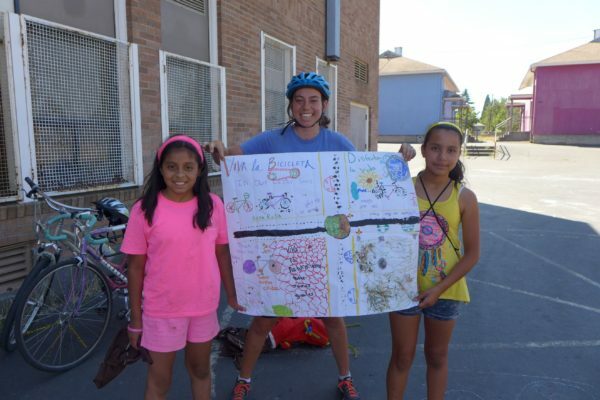 The second week of scholarship camp was at Rigler Elementary School. 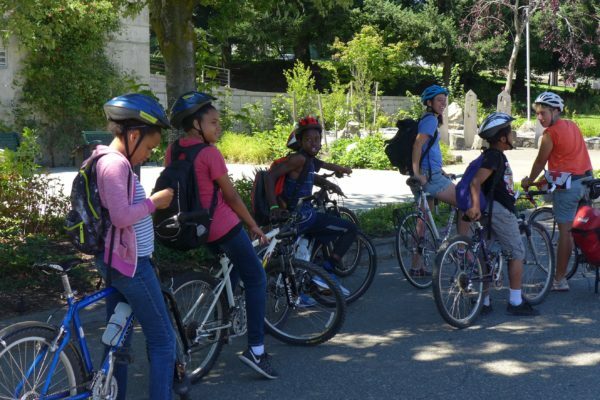 We had some very skillful bikers who bravely biked through the busy overbridge on our way to the Whitaker Ponds Nature Park. It was worth the ride because we had the chance to find small pieces of rat bones spit out by owls and take a sample of fish from the Columbia Slough (and of course, set them free afterwards). The apple tree there offered a great source of snack for us as well. Our guide took us to a pine tree and told us that owls often come here, so we should be able to find some rat bones on the ground. Everyone started looking through the pine needles on the ground immediately, and we were lucky enough to find some pieces of tiny bones. A girl even found a rat pelvis! It was eye-opening to see the hidden traces of owls. They even got to keep the bones. Our campers became all excited about the little scientific experiment, which gave them the opportunity to catch small fish in the slough with webs. They were divided up into three groups, with three or four campers each group, and they took turns trying to catch organisms. The result was quite interesting. We got mostly tadpoles, but occasionally small fish that might correspond to one or two types of fish illustrated on the information sheet. These tiny fish were instantly popular, with everyone circling around the small bucket where they temporarily reside. 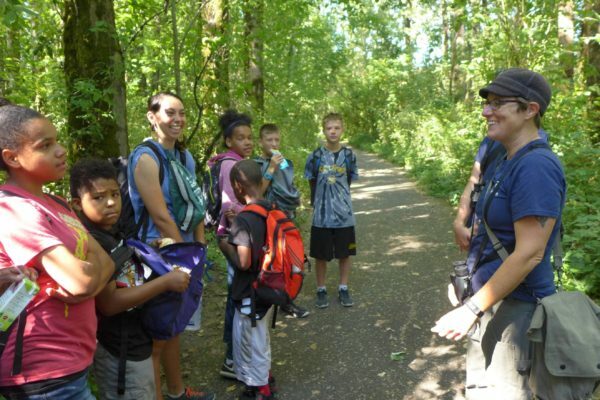 The hands-on activity was a great way for the kids to intimately interact with the local species and learn about the environment around them. 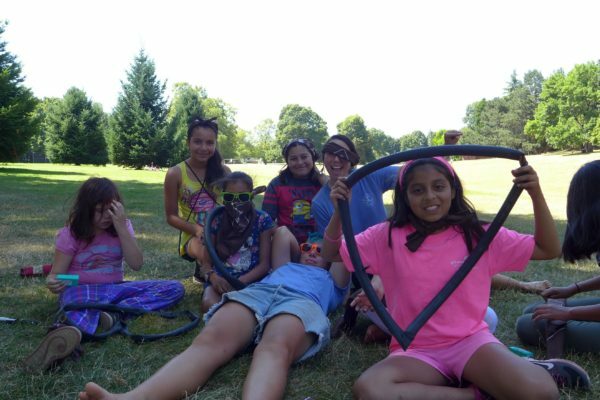 Later that day, the campers learned how to patch a flat tire. While waiting for the glue to dry, they styled their bike camp bandanas based on their sense of the latest summer fashion trend. There was also a spontaneous session of intense dog-petting—we met a professional dog walker at a park, who was walking over ten dogs that afternoon. Like any bike camp at CCC, we had a fun and productive afternoon, concluded by a bike camp theme song, composed by our very own camper, Jenni. Look! We even have an illustrated, bilingual poster for the bike camp theme song!